Yellow River Pollution Is Price of Economic Growth All along China's mother river, serious air and water pollution — the high cost of China's breakneck industrial growth — is evident. The environmental damage has catalyzed activists, but even those who worry acknowledge the contradictions of development. 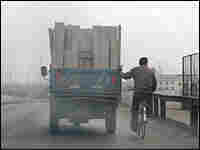 An NPR series examines the toll China's rapid industrialization is taking on its mother river. Second in a five-part series. By the time the Yellow River reaches the industrial city of Lanzhou, in northwestern Gansu Province, its waters are muddy and brown. 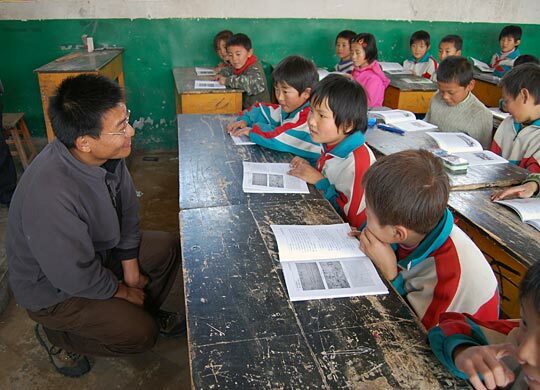 Zhao Zhong is an environmental activist in Lanzhou. His group, Green Camel Bell, works in communities, spreading the word about environmental protection. 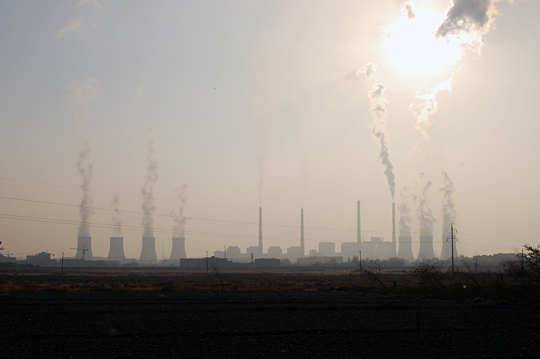 Smokestacks in Jingyuan County, about two hours outside Lanzhou, are symbols of the country's rapid industrial growth. The government is trying to encourage balance between the new industrialized cities and the still-undeveloped countryside. 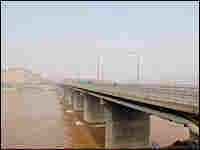 In China, there's a saying that a dipperful of water from the Yellow River is seven-tenths mud. 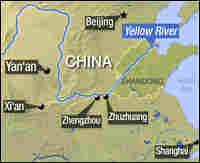 The river contains more silt than any other waterway in the world, gaining its name from the loamy, yellow soil that bleeds into the river as it descends from the Tibetan Plateau. But in recent years the Yellow River has gained another, more notorious claim to fame as one of the world's most polluted rivers. The very high environmental cost of China's rapid industrialization can been seen all along its banks. 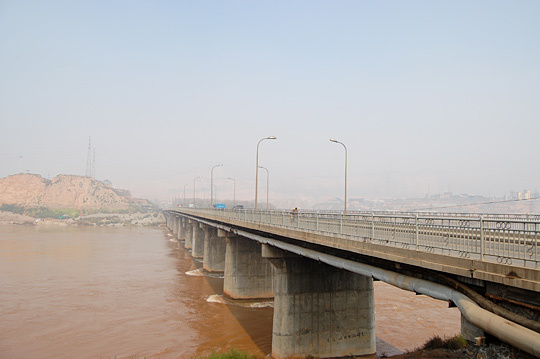 By the time the Yellow River reaches the city of Lanzhou in northwest Gansu Province, it's a muddy brown color, having picked up soil, silt and industrial waste. Lanzhou is commonly cited as one of the top 20 most polluted cities in the world, the cost of decades of extraordinary economic growth. Two hours downstream from Lanzhou, in the blur of smelters and factories of the industrial city of Baiyin, a dark, fetid outflow that barely passes for water is draining into a stream. 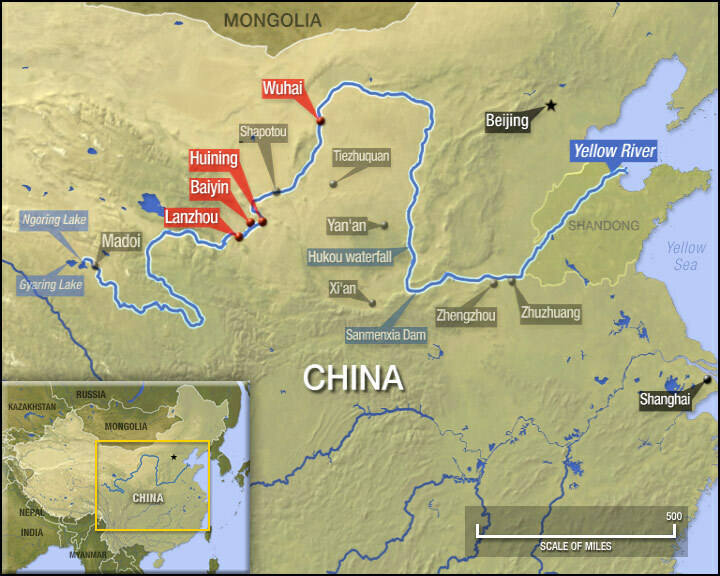 The stream flows into a small tributary that then flows directly into the Yellow River. Here, suspended in the filthy water amid the sounds and smells of the industrial revolution, are some of the biggest questions facing modern China: Can the country maintain double-digit economic growth without destroying the natural environment? And is the blowback from industrialization starting to negate the very real economic progress? These are questions that people inside and outside of China are asking. With the rise of pollution has come the rise of a new kind of citizen: the environmental activist. 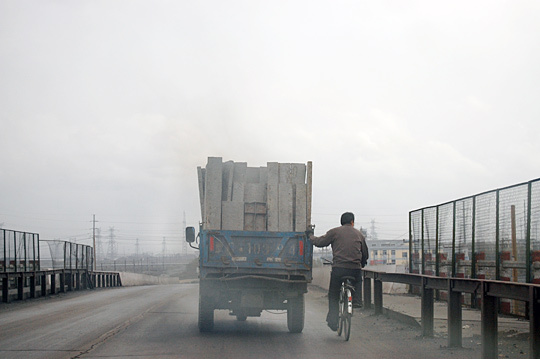 Zhao Zhong, 25, came to Lanzhou as a college student and immediately became concerned about the pollution. Three years ago, he set up a nongovernmental organization called Green Camel Bell. His organization works in rural schools and communities, spreading the word about environmental protection. His gentle manner belies a steely commitment to the cause. Zhao says it's his job to empower China's next generation, to make them feel that they have a stake in a cleaner China. He also says Green Camel Bell and other NGOs are filling the space left by the retreat of the Communist Party from people's everyday lives. "The government has given us space to do this kind of project," he says. "They allow us to work on environmental issues at the community level. We can't do anything about policy. We just don't have that ability. So we do what we can do, working within the space that the government has granted us." As the river heads north from Baiyin, it passes through grimy, industrial places that few people outside of China have heard of. In the city of Wuhai in Inner Mongolia, a group of students gathers to share a meal and discuss the contradictions of development. "Of course, if you want more income, it's going to cause more damage to the environment," says Zhang Xuemin, a 20-year-old college sophomore. "Look at all the paper factories around here. If they installed expensive cleaning equipment, it would reduce their profit by a lot." The students all come from towns near the Yellow River, and several of them have horror stories of river pollution near their homes. Qi Boyuan, who grew up downstream in Dongsheng, says he learned how to swim in the river. "But now, if I had children, I certainly wouldn't let them swim in it," he says. Qi does, however, believe that the government is trying to improve matters. "They no longer just say 'development first, and manage the consequences later.' Now, the policy is 'develop and manage at the same time.' They're emphasizing harmony." The word harmony has been used as part of a widespread government propaganda campaign to talk about the balance it is trying to encourage between winners and losers of the economic boom, between the new industrialized cities and the still-undeveloped countryside, and between economic development and environmental sustainability. 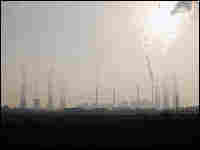 But places like Wuhai, Baiyin and Lanzhou call into question whether the contradictions facing China, especially the environmental ones, are becoming too great — and whether the development that is strengthening China is also threatening the country's future. 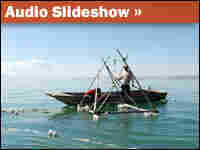 This story was produced for broadcast by NPR's Andrea Hsu.